the constant pursuit of innovation that has characterized our history and continues to guide the choices for our future starts here. 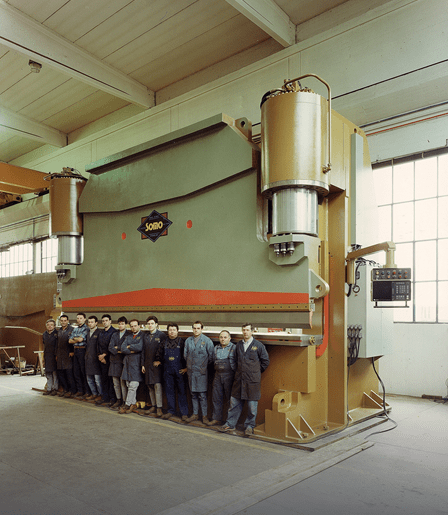 Since 1960 SOMO has always produced customized presses and shears machines for the international market. During the last 15 years, SOMO focused its attention on feeding system and manipulation for handling metal sheets during forming, using electronics to control finished products' quality by measuring the width of the sheet to bend and during the bending. Everything is managed by a PLC entirely designed by SOMO , which allows to produce pipes and Tubess in sequence, one different from another, with a very fast set up of the machine. SOMO produced and settled bending plants up to 9,000 tons and customized press brakes from 300 to 3,000 tons for specific manufactured products. SOMO is able to supply plants being competitive within the international market: our core business is to understand our customers' needs, helping them from the beginning of their investment, suggesting the better economical strategy and looking after them even after the delivery. We are always there when they need.